Harvey Evans - Call on Dolly! It all started with a wonderful teacher in Cincinnati, Ohio, Pat Goldin. This justifies why Harvey Evans feels that he was able to work with so many different people. This dance teacher was a real vaudevillian and he taught his students to imitate Eddie Cantor, If You Knew Susie, and all the other great Vaudevillian stars. Consequently, Harvey has never thought about performing and dancing any differently than acting and singing; they are all the same to him. He taught them to entertain, that’s what it is all about. Harvey’s love of performing started early on. Pat would send them out to do shows every weekend. Harvey knew that he had to be technically good, but never strived for that. He strived to do it. Liza Minnelli once said that after she learned the steps of a choreographer, then she would watch his face. She would then see what he desired to do with a step. By doing so, she was able to “act” the step. When Harvey left Ohio, he immediately began work with Fosse, then Gower, then Jerry Robbins. It was because Harvey really thought of dancing as acting. He also hit the golden era at the right time. 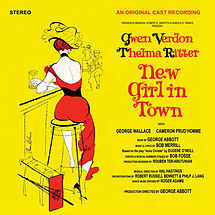 He did Damn Yankees on Broadway, did the movie version of The Pajama Game, he did New Girl in Town and Redhead, both with Gwen Verdon and Bob Fosse. When West Side Story was getting ready to open, Harvey saw the run through and fell in love with it. He was so obsessed that he had to be in WSS. He got to be one of the first Jet replacements. He also ended up doing the movie. He worked with Robbins again in Gypsy as Tulsa’s understudy with Merman. After that, Harvey got a part in a stock production of Babes in Arms and that was his introduction to acting, singing, and dancing at the same time. He had a lot of “bits” in New Girl in Town and everyone in the cast had lines, but Babes was his first big role. It was supposed to come to Broadway. Richard Rodgers supervised it. Rodgers called Harvey, Harvey Purim. 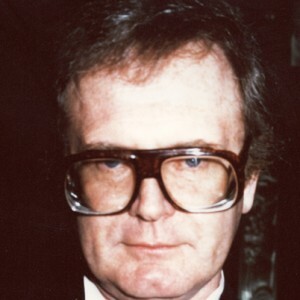 Harvey’s real name is Harvey Honiker. He had not changed his name at that point it was a pun on Hanukah. That was his association with Richard Rodgers and a lucky break. He can’t express how lucky he was to be part of this golden era and working with all the giants. When one worked with them once and they liked them, they would desire those same artists in their next shows. They would become Robbins dancers or Fosse dancers or Champion dancers, etc. Harvey was in the road company of Damn Yankees playing LA. Gower saw the show and came backstage to see the leading lady. Harvey was coming down to his dressing room. Gower saw him and told him he liked him very much. Harvey told him that he was such a huge fan of Marge and Gower. They were the biggest MGM stars in the world to him. They had a mini one on one conversation. Harvey stayed in LA after he did Damn Yankees and Gower was doing a movie called The Girl Most Likely. Harvey saw that he was auditioning dancers and wrote to him at RKO Studios. Gower answered him! He remembered Harvey and asked him to come in and audition. Harvey did and got to dance in The Girl Most Likely. At that point, there was an organization called Central Casting. If you weren’t in Central Casting, you could not be in the movie and vice versa. It was a catch-22, very much like Equity. Gower got Harvey into central casting and that was his first association with Gower. When Gower came to New York to do Bye Bye Birdie, he called Harvey. However, Harvey had just signed to do Gypsy. 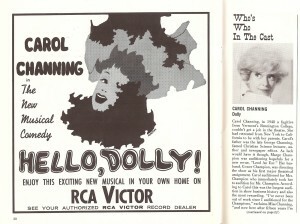 Gowere would go on to call on Harvey for Carol Channing’s first national tour of Hello, Dolly in 1965 and also cast him in the film, The Bank Shot, in 1974. 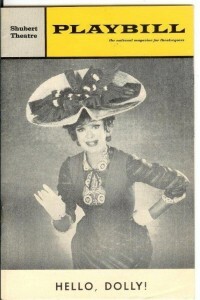 When the original auditions for Hello, Dolly were held in August of 1963, Harvey did not audition. He was out of town with Anyone Can Whistle. After multiple revisions, the show opened on Broadway on April 4, 1964 at the Majestic Theatre, where it closed after 9 performances and 12 previews, unable to overcome the generally negative reviews it had received. 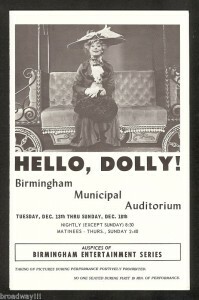 There had already been a mini national tour of Hello, Dolly starring Mary Martin. That tour began in Minneapolis, Minnesota in April 1965 and continued to Kansas City, Missouri and New Orleans, Louisiana,Dallas, Texas, and Memphis, Tennessee. The United States tour would end in Portland, Oregon before embarking to Tokyo, Vietnam, and London. for Barnaby Tucker for the Mary Martin Company. He was torn. Debbie called Gower, told him that Harvey was torn, and asked if he could audition in the future. Johnny Beecher ended up getting the job. Harvey worshipped Gower. 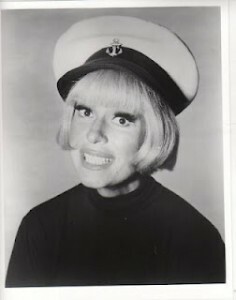 When he was ready to send Carol Channing out in her tour, he was again called Harvey. This time, Harvey was ready. The tour started in San Diego the first week in September for a tryout before going to the Dorothy Chandler Pavilion in LA in mid September 1965. Harvey would stay with this tour for one year. In terms of what an acting teacher taught Harvey years before, everything Carol did was “wrong”…and yet it worked…for her. She did everything the same every single performance; she manufacturing the moment rather than truly living in it. She DID live in the moment as a programmed actress. The thing that saves her is that she finds the humanity and comedy in it. Acting teachers encourage actors not to strive for the “same” performance because the performance won’t be “real”. Live in the moment. Carol breaks that rule. Carol is the only person that Harvey knows in show business who can get away with that and make it wonderful. He believes it is because she is smart enough to seek out the pathos in the Ephraim speeches. She knew she could kill with those speeches and she did. She slayed people with that, they were so wonderful and so truthful and so meaningful. She could do that at the drop of a hat. Harvey got along with Carol but did not have a relationship beyond a professional one. Barnaby is a scene stealing part. Other “Barnabys” have mentioned trouble if they ever stepped outside the realms of what Carol specifically desired them to be. that the show wasn’t working with Harvey’s understudy, Spider Duncan. He was wonderful. She made a desperate call for him to come back to the show. It was the 20th Century Fox scouts coming in to see the show. It wasn’t Gene Kelly. She still thought at that moment that she had a shot at the film. Shortly after that, Carol left the show while in Chicago to shoot Thoroughly Modern Millie. Eve Arden did okay in Chicago for 17 weeks in the summer and fall of 1966 as Miss Channing’s replacement. According to Harvey, Arden didn’t get enough rehearsal time. Lucia came in and worked with her. She wasn’t as good at the beginning but she grew into the part. Gower did not work with her at all. She finally ended up playing Eve Arden and get the laughs. No one could deliver a line like Eve Arden. On top of that, she was one of the best human beings, ever. She did get involved with the Company. There was a boating tragedy (Check out chapter on Spider Duncan). Eve really took care of those kids. Harvey tears up remembering how wonderful she was with those kids. He is also a great Eve Arden fan. Harvey was with the show for one full year. When he left the company, Eve Arden was still with the show. When Harvey left the show, Don Slayton took over his role. A year later, John Mineo, who was playing Barnaby on Broadway, wanted to leave the company, and once again, Harvey was called. The show had been running two and a half years by this point. Harvey had gone back to work with Debbie Reynolds. The joy of going to Broadway, for Harvey, was getting to play opposite Will Mackenzie as Cornelius. Tolson, the stage manager’s office. They would be told to cut the bit. Three days later, Will would come in with something else for them to try. They would do it because they wanted the show to get those laughs. Betty Grable was not amused. She was not the comedienne that Carol was. Once Will suggested that in the hat shop scene, that Harvey back up and let the feather goose him. It was a brilliant moment and got a huge laugh but that was NOT Gower. Harvey jokingly says they were fired by Pearl Bailey’s all black company. There was a transition period between Betty Grable and Pearl Bailey and Harvey got to play Barnaby opposite Bibi Osterwald’s Dolly for one week. 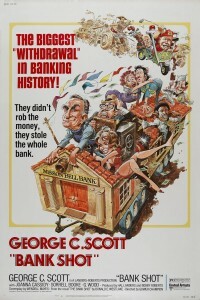 Bibi and Harvey also worked together in Gower’s film; The Bank Shot. They became instant buddies during his time with the Broadway Dolly Company. She was a combination of all of the Dolly’s and about as good as one could possibly get. 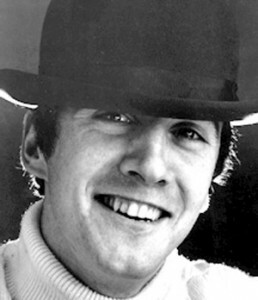 That was the end of his Dolly days…as Barnaby. 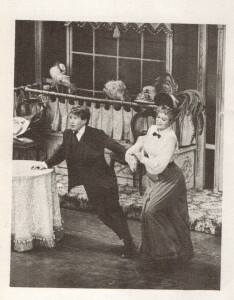 (He would play Horace years later in a concert version opposite Pamela Myers as Dolly). Harvey did see Pearl Bailey play Dolly and thought she was brilliant. Her reputation was not great; she was difficult. He witnessed that. 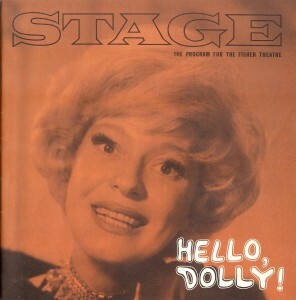 He was in the audience for the special that she did with Carol Channing, Carol Channing and Pearl Bailey: On Broadway. It was not a nice experience for the audience because Pearl Bailey was just temperamental in front of the audience at the taping of that show. He was so embarrassed by her unprofessional antics. He met Pearl Bailey once when she was appearing at the Riviera Hotel before his show with Debbie Reynolds opened. Debbie got sick and had to postpone a few days. Pearl Bailey stayed on until Debbie was ready to open. brilliant. He is a Martha Raye fan. She did the best So Long, Dearie of anybody, better than Carol’s as well. She was an old trouper and her Ephraim speeches were heartbreaking. He did not see Ethel Merman. When the movie starring Barbra Streisand first came out, Harvey was not thrilled with it.As time has gone on, he likes it better.He wasn’t crazy about the musical numbers then, but he is now.He thought Danny Lockin was wonderful. Harvey believes that the reason Hello, Dolly continues to entertain audiences is because it is so beautifully constructed. Louis Stadler, who did a recent production of Dolly, says the same thing. He cried during the sitzprobe, saying they just don’t make them like that anymore. A sitzprobe (German) is a term used in opera and musical theatre to describe a seated rehearsal—the literal translation of Sitzprobe—where the singers sing with the orchestra, focusing attention on integrating the two groups. 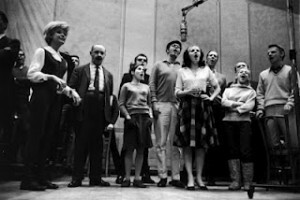 It is often the first rehearsal where the orchestra and singers rehearse together. Harvey says his experience from everybody else’s. He loved being in Anyone Can Whistle very much. He knows that show didn’t work and he knows a lot about the cause of that. As an experience, it was glowingly wonderful for him. 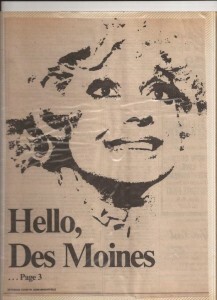 When they came in, Dolly had just opened and was a major hit. His dressing room overlooked the St. James Theater. There was one performance in which Gower was in the audience and Harvey was thrilled. At the first intermission, he and his group left. In fact, Harvey saw them walk into the St. James Theater. From that point on for a while, Harvey had a block about liking Hello, Dolly! Then he saw it and fell in love with it. Once he got into it, he loved it even more. Looking back, there is nothing Harvey would change. He is very happy with that period in his life. He got to do four Sondheim shows. He got to do Gower’s best work, Hello, Dolly! Nothing was as good as Put On Your Sunday Clothes. Some of his work in The Happy Time was equally good. “The Happy Time got screwed.” It was a lot better than people think it was, Harvey thinks. Harvey would have liked to have worked with Jack Cole and Michael Kidd. If that had happened, he would have worked with all the masters, the geniuses. Harvey thinks Hello, Dolly should return to Broadway, but it is too hard to say who he thinks should be Dolly. What did Harvey like MOST about being in Hello, Dolly! “Playing Barnaby.” There was not a LEAST! It was a totally positive experience and he got to do things like moving the set at the end of It Takes a Woman as it was brilliantly staged by Gower. Gower also gave Harvey a wonderful bit which had not been done by previous Barnaby’s. It took place in the hat shop scene when he is hiding under the table. Harvey’s recollection is that Gower whispered to Horace McMahon, who was playing Vandergelder at the time, to hit the table with his cane as hard and as loudly as he possibly could. At that point, Harvey had his head out, facing the audience. Harvey didn’t know what was going to happen, but he did a “cartoon” Roadrunner kind of take where he slowly let his face fall apart, taking the curtain, and slowly let it fall down over his head. That bit stayed in. Danny Lockin also did that bit in the movie. 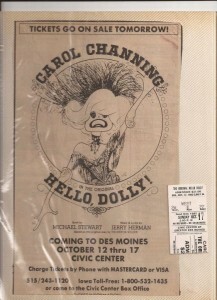 In previous chapters, there has been mention of the Carol Channing/Horace McMahon “rift”. Harvey knew there was trouble. McMahon was not “fast enough.” He truly was not good enough. He was not a stage actor. When an actor is opposite Carol, he has to be “with it…to be right there.” Everyone knew that both Carol and Gower were unhappy. Everyone could sense it. He was eventually replaced by Milo Boulton. When Harvey went to Broadway to “replace” John Mineo, he wasn’t thinking of his own performance. He was thinking about making everyone happy. He doesn’t like replacing someone. He admits that he stole as much as he could from Jerry Dodge. As the part grew on him, he began to add his own touches. The wildest thing that Harvey remembers is a crazy person in the ensemble. He fell in the pit once. Several people fell in the pit. There were strange things always happening around this person. Once, the fire alarm went off where they were staying. It was a false alarm. They finally figured out that it may have been this one person. There were always strange goings on. What did Harvey bring to the production? Gower was so theatrically show business that Harvey brought all of that to the production. Before Gower came in to work with the National Company, Lucia Victor put it up and staged it. 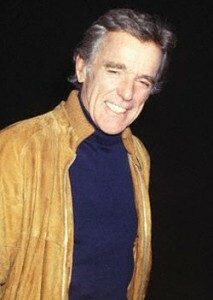 Harvey, as well as the rest of the cast, tried to stay within the guidelines of the original Company. Harvey never felt that he had much freedom, but he did what he desired especially in his own line readings. Harvey didn’t care for Lucia’s work too much. It was very professional, but he found it cold. It was hard to read her. He never knew if she liked him or not. When Gower came in, Harvey always knew if he was pleased or not. He always gave more encouragement to go further. Harvey loved working with Gower. He also points out that Jerome Robbins has a terrible reputation. Gower was just as strict. He had his bad days. When anyone heard his tongue clicking, everyone shut up. 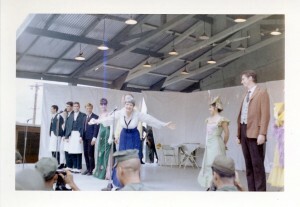 Opening day in LA, they had a long dance rehearsal prior to opening that night. Harvey learned, doing Dolly, that his knowledge of show business was very good. 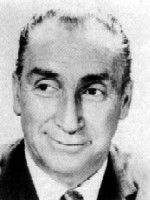 Gower used many show business references. Because of his training, Harvey understood those references. If one were to analyze Barnaby, he is just every cute young kid you’ve ever seen. There is not much to play there. “Play cute innocent kid and you’ve got it made.” Harvey knew how to do that in a theatrical way from knowing a lot about the theater. Harvey is not like the new generation. He knew every MGM movie before he came to New York. He knew what shows Gwen Verdon was in. 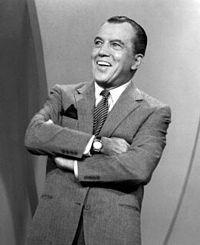 They had Ed Sullivan. He really loves what the Ed Sullivan Show did for him. It gave him a knowledge of opera, classical music, dance, what was on Broadway, what Peter Gennaro was doing, etc. Kids don’t have that knowledge these days. Audiences know when they see a great show. Hello, Dolly is that show. They exit the theater joyful. Going in, audiences know that Dolly will take her final bow in white. It’s just built that way. It makes audiences crazy. Everyone is waiting when the cast turns upstage for Dolly’s final entrance. That’s Gower’s doing. That, once again, was his knowledge of what worked in show business. The difference between Robbins and Gower was that Robbins went for the soul of the person. Gower went for show business. Harvey LOVES LOVES LOVES Jerry Herman! In addition to Dolly, Harvey also did La Cage Aux Folles. What Harvey didn’t like was this “fight” between Herman and Sondheim. Harvey feels that when Herman won his Tony, he made a remark he shouldn’t have said. It was along the lines with his win that people loved true musical theater. 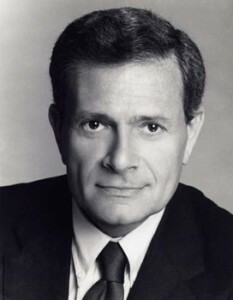 Jerry Herman won the 1983 Tony Award for La Cage Aux Folles over Stephen Sondheim’s Sunday in the Park with George. They are totally two different people and Harvey adores them both. Once during a rehearsal of La Cage, Herman took director Arthur Laurents into a corner to discuss something. Harvey’s insecurities kicked in and immediately he thought they didn’t like him. 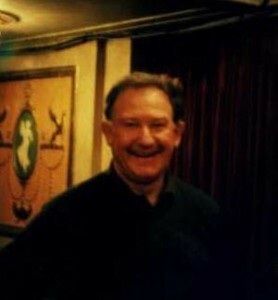 Harvey played opposite Larry Kert in the second National Tour. Harvey and Larry had been friends since West Side Story. They had a playful quality playing opposite each other which really worked in their favor. It was a wonderful joyous experience for Harvey. 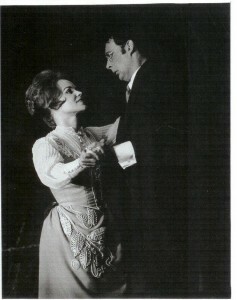 Harvey’s final performance of Hello, Dolly was on November 10th, 1967 with Bibi Osterwald. The company was not happy. They wanted to stay longer; they were having a good time. They were being evicted by Pearl Bailey and company. They were doing great business. Betty Grable had left the company the week before on November 5th. No one knew how sick she was. She died six years later on July 2nd, 1973. She had had severe vocal challenges. Although there were still several road companies still in existence, Harvey was not offered any of them. Harvey went into George M and was back on Broadway the following April of 1968.
stage purposefully at the wrong time in Dancing. Charles doesn’t know if this is true or rumor. He worked with Sondra Lee her last week in the show. It was his first week and he was scared to death of working with Sondra Lee because he was afraid she wouldn’t like him. They hit it off immediately and became fast friends. She told Harvey that he reminded her of Spencer Tracy. A bigger compliment could not have been paid to him. 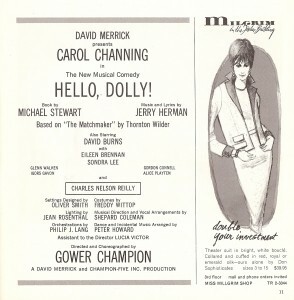 Theatre Jacksonville presented a concert version of Dolly in 2009 starring Harvey and Pamela Myers at the Harold K. Smith Playhouse. Without meaning to, he channeled David Burns. He just flowed right through him. He and Pamela have similar ways of working and had a delicious time. 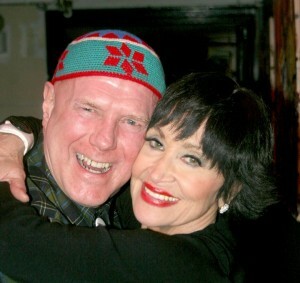 She was a wonderful Dolly and he wishes they could do it more. 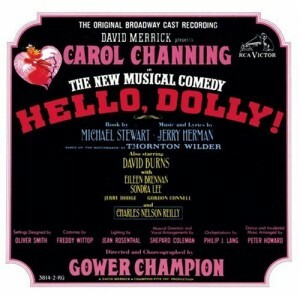 Hello, Dolly to Harvey Evans evokes “proudness”. 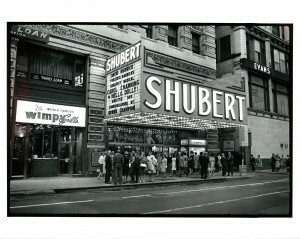 It is one of the jewels of great American musical theater and Harvey was proud of it. That makes him very proud.